Mahalo, Aloha & we hope to see you all this coming FRIDAY, 22 MARCH 2019 at FILCOM CENTER WAIPAHU, HI for another mind blowing Fight Night "MARCH MADNESS"
X1 World Events, organizer of the new “March Madness”, announced their Professional Mixed Martial Arts MMA Event event will be held in the new fighting Arena at the FILCOM Center #94-428 Mokuola St #302, Waipahu, HI 96797. 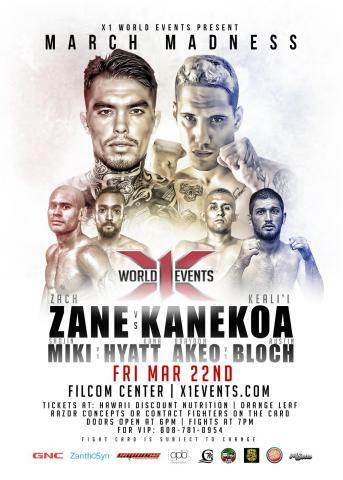 Fight Fans and Sports Enthusiasts looking for the latest information on “March Madness” Hawaii MMA Live from the FILCOM CENTER “March Madness” scheduled for March 22, 2019. X1 is bringing you X-1 #52 “MARCH MADNESS” featuring some of Hawaii’s best fighters, going up against top fighters from around the world! In the Main Event we’ll have Zach “God’s Warrior” Zane going up against Big Islands Keali’i “The Saint” Kanekoa in a 170lb Pro MMA Bout for the vacated X-1 State Title..In the Co-Main we’ve got a battle between 2 State Champion wrestlers, as Oahu’s Braydon Akeo will be facing Austin Bloch of the Big Island in a 145lb Pro MMA Bout. Both fighters are undefeated, so somebody’s “O” has to go. This will be one show that you do not want to miss and that’ll start the new year off with a BANG!!! Tickets go ON SALE TODAY on Tickets available at Hawai’i Discount Nutrition (Honolulu), Orange Leaf (Kalihi), and Razor Concepts (Aeia) or call/text 808-781-0954 or 808-426-8900. With the hype surrounding these fights, it’s expected to sellout…so get yours ASAP before it’s all sold out & support your Hawaii fighters! Thank you to all the fighters who’ll be competing on MARCH 22, 2019, as well as to everybody who has been a part of making this show happen…coaches, sponsors, vendors, etc. & a big thank you to all the fight fans who continue to support our shows, its not possible with out all of you & each person is much appreciated.